“Taneyev is one of the few with genuine promise – he will be a magnificent pianist and splendid composer”, is how N G Rubinstein praised his pupil. When it comes to Taneyev’s compositions, there is still plenty to discover. Born in Imperial Russia, at the age of 10 Taneyev enrolled at the Moscow Conservatory to study the piano (with Rubinstein) and composition (with Tchaikovsky). While in Paris, he made the acquaintance of Turgenev, Gounod, Flaubert, Saint-Saëns and other great artists. At the tender age of 28, he assumed the post of director of the Moscow Conservatory, where his pupils included Rachmaninov, Scriabin and Glière. The detailed elaborateness of Taneyev’s complex scores bears witness to his thorough exploration of the works of Bach, Mozart and Beethoven, and a sharp intellect that remarkably blends with bold emotionality in lyrical and dramatic areas. 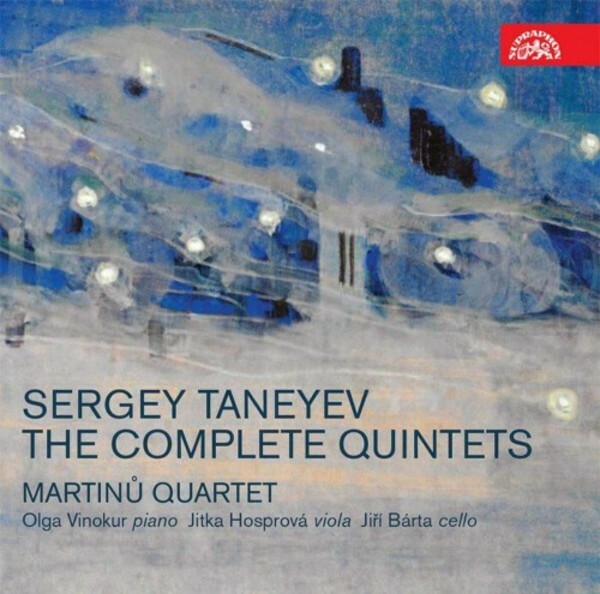 The wide colour spectrum has been rendered splendidly by the Martinů Quartet and their guests on this new recording of the complete Taneyev quintets – an album that serves as proof of the artist’s position among the most distinguished European composers.